But what you may not know is that the renovation dominoed (is that a word?!) through the home in a big way. 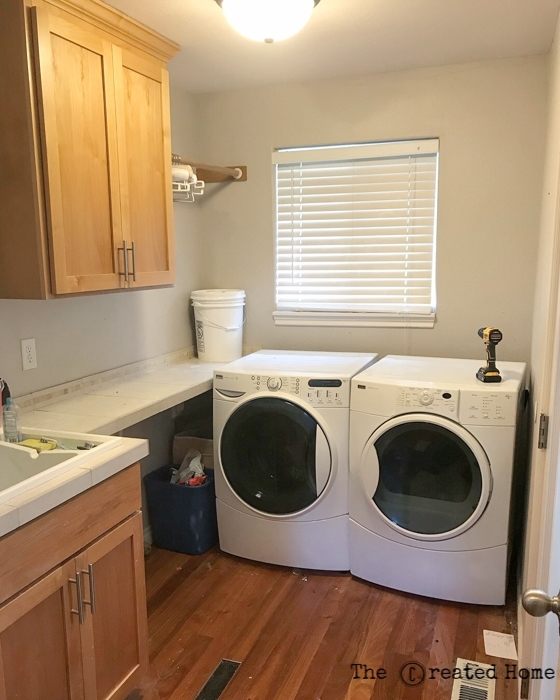 See that laundry sink through the doorway of the before image? And the pantry? It was actually farther down that narrow hall, in one of those closets. Hint, this part of the hallway is still under renovation and will be awesome beyond all reason. Or at least pretty freaking cool. But I digress. What we decided to do was to turn that odd laundry area into a combination pantry and laundry closet. Unfortunately, there’s just no better place for the laundry in this house, so there it stays. I tell myself that I don’t need an entire room for laundry anyway, but probably I would actually like it if I did. This plan necessitated doing something I pretty well never do – I took out a window. Guys, I’m the biggest natural light freak you will ever meet. It has to be pretty well pitch black for me to turn on a light. It’s a thing. We framed in a new header to hold the bypass sliding door hardware and create a separate space. I won’t bore you with any more construction photos. The next step was to add this fabulous-beyond-all-reason wallpaper by Anthropologie. Oh, my heart. I love it. The shelves are cut from melamine and supported with these inexpensive brackets from Amazon. Side note: Oh my gosh, have you noticed how expensive brackets can be?! Let’s be real, people. I mean, I splurged on the wallpaper. I dressed up the shelves a little with some simple natural wood trim. The natural wood helps channel that Scandinavian vibe, don’t you think? I built the cabinet out of reclaimed doug fir, the same material I used to construct this facade around our apron sink in the kitchen. My intention was that the two pieces would tie the areas together. The flooring continues from the kitchen and throughout the main level of our home. It’s a laminate flooring by Select Surfaces that was super easy to install and does a great job putting up with the abuse that kids, a dog, and two remodeling adults put it under constantly. The light is from the Piper collection by Kichler. If you follow me on social media you have probably heard me rave about these before. Because my love for them knows no bounds. It is that deep. The baker’s table is a piece I was lucky enough to find locally. I love the character of a truly antique piece and its ability to ground a space. The doors are DIY and feature classic craftsman lines meant to echo the simplicity of the shaker cabinets in the kitchen. I constructed these large bypass doors and spayed them with my Wagner FLEXiO 4000 for a beautiful, smooth finish. The handles are inset and minimal. They are also on Amazon and are really quite inexpensive. 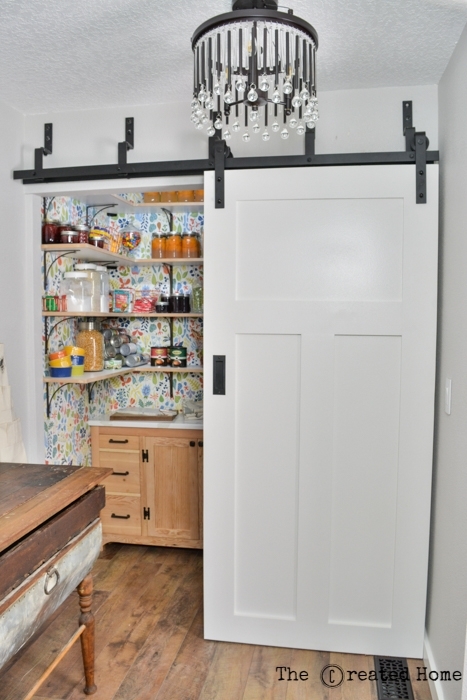 The sliding doors allow for easy access to either the pantry or the laundry and fit where no other style of door would work. That’s it! All that’s left is another quick look at how it all came together. Personally, I love how it all came together. 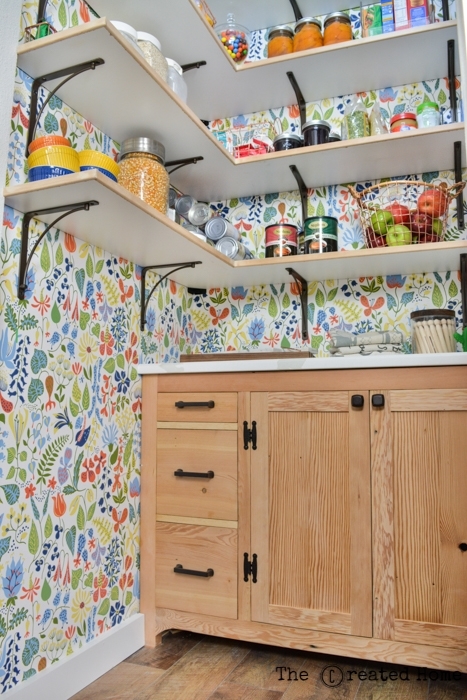 I realize not everyone may love the idea of laundry and a pantry sharing space, but it’s very European, you know? Not to mention awfully convenient. Wash the clothes, snack on junk in the pantry. Something like that. Bam, one less area of the house to renovate. Onward. Sarah, this is such an awesome space!! I LOVE the wallpaper, cabinet, the fact that you cut the granite yourself!!!! 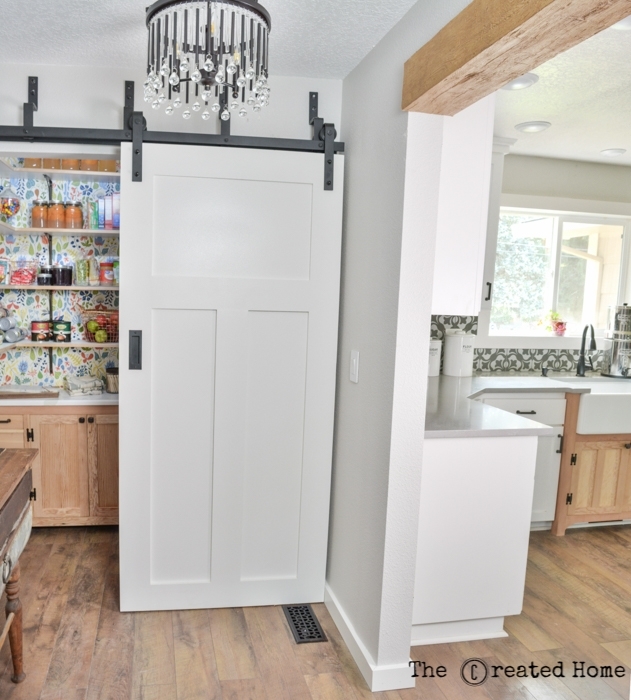 !, the barn door, the proximity of the laundry and pantry to the kitchen – you did an amazing job with this reno!